Picabo rancher and businessman Bud Purdy was recently inducted into the Spirit of Idaho-Idaho Hall of Fame, an organization established in 1985 to celebrate notable Idahoans. Purdy joins writer Ernest Hemingway, poet Ezra Pound, skier Picabo Street and political leader Pete Cenarrusa as the other inductees from Blaine County. In December, the Idaho Hall of Fame presented him with a plaque in Picabo, where the Purdy family has had a ranch since the 1800s. Purdy hunted ducks with Hemingway and at age 94 still works and flies his own airplane. 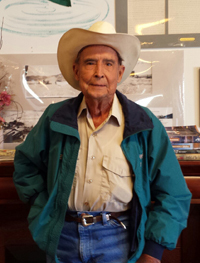 Although Purdy had earned a degree in business, he worked as a ranch hand for five years, learning the ranching life the hard way. Bud married Maxine Dahl in 1939, and they had three children, Nick, Kris and Mark. They were later divorced. In 1943, the ranch foreman quit and Purdy took over. World War II was continuing and help was hard to find, but thanks to some local ranchers and very old workers they managed to get by. Purdy married Ruth Eccles, and she, with her son Gordon, moved to the ranch in 1952. In 1955, Purdy and his sister and brother bought the ranch from the Kilpatrick brothers. He kept the main ranch and his sister and brother bought the sheep and their range. He added to the ranch over the years. The Purdys bought the Picabo General Store, which had been started by the Kilpatricks in 1902. The store is now operated by Nick and Sharon Purdy and Rancher’s Supply by Bud’s grandsons. According to a close friend, Purdy has slowed down recently, but was alert and excited to receive a plaque from the Idaho Hall of Fame. Each year, the Idaho Hall of Fame board members send invitations to members of academies, government agencies, businesses and individuals to submit candidates for future Idaho Hall of Fame inductees. The first Hall of Fame Banquet in 1995 celebrated 11 noted Idahoans, including William Borah, Vardis Fisher, Chief Joseph, J.R. Simplot and Lana Turner.